Header Boad stained to match the door is mounted to the wall above teh dorr to anchor the track and sliding door hardware installation. 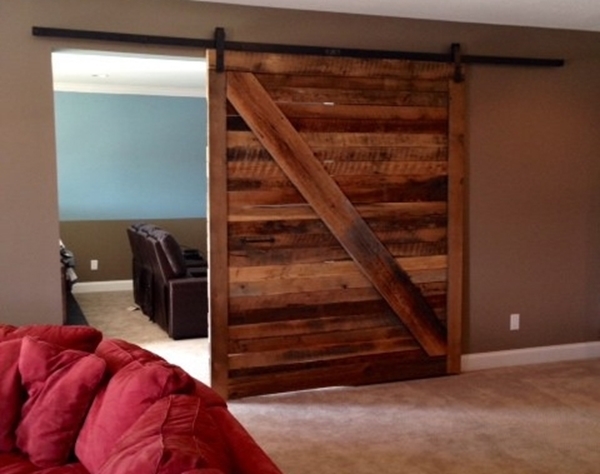 Closet barn doors add character and personality to any room. At Trending Home Décor we’re proud of our reputation for being market leaders in modern and contemporary home design and decoration including barn doors for closets. For example, watch many of the home improvement shows on TV these days and you’ll be surprised at how often closet barn doors appear. We offer a striking range of barn doors for closets that can be functional but also add an attractive design feature to your home. Closet barn doors are popular for several reasons. They’re attractive. They’re easy to install. They take up less space than a traditionally hinge hung door. Barn closet doors are flexible in that they can be hung singly or in pairs to cover large closet openings. Barn sliding closet doors can be used in many areas in your home. Kitchen pantries. Bathrooms. Bedrooms. Dens. Living rooms. Room dividers. Bypass doors. Barn door closet doors are ideal for many cottage applications. Given the range in style, construction and finished texture you’ll find that we offer barn door closet doors to meet every situation and location. Barn doors for closets ~ A great decorating idea! Have a look at our website at: www.trendinghome.com. You’ll find a wide range of closet doors. Sliding barn doors come in a variety of designs as you’ll see. And of course on our website you’ll find a complete supply of closet barn door hardware as well. Our very popular Canadian Classic Pine door has a rustic and traditional appearance that you would find suitable for bedrooms, family rooms and cottages where barn door closets closures will be attractive and functional. For a more formal look in sliding barn door closet style you might want to consider our Shaker Acacia barn doors for closets that come in either Textured Grey or Wenge Brown. Change the colour or change the closet barn door hardware you select and you change the tone and texture of your room. One of our popular rustic models of the sliding barn door for a closet is the Rough Half-X Sawn Pine. This traditional informal design is quite inexpensive and can be purchased with various finishes to suit the rest of your décor. Its construction with first quality materials makes it durable yet visually striking. It will serve you well for many years. Our barn doors come in various common stock sizes that will fit most closet openings. But, if those sizes won’t work for you, we can create a custom barn door that will suit your individual needs. Have questions? Use our Live Chat option on our website to talk with Dave our barn door tech support specialist. Dave will answer all your questions and help to resolve your purchase or installation issues. You can also reach us at info@trendinghome.ca. Use our top of the line closet barn door hardware to hang your new door. Order your new barn door online using the shopping format on our website. Give us a call at 1.647.457.6011 if you have any questions or need the details on how to order a custom sliding barn door. Our doors also come in a selection of finishes so work with Dave our tech specialist to make certain you purchase the best door, hardware and finish for your specific room. We offer a variety of hardware packages and options to make certain your new barn door creates just the right impact in your room. We offer durable stainless steel and black steel rails and wheels that will ensure many years of attractive service. These products are made with top end materials selected for their appearance and durability. On our website you’ll find no fewer than 6 different attractive handles. Select the model that best compliments your room. We also offer rustic coat hooks and locking systems to complete your purchase. Purchase one of our doors and a hardware package to hang it and we’ll offer you a handsome discount when you purchase door and hardware at the same time. If you live in the GTA we can deliver your door for a reasonable cost in a matter for 10-14 days. Delivery may take a bit longer in other regions of Ontario. Installing your new barn door is as easy as one two three. All you need for your easy installation are some simple tools that most people have around the house. Drill, screw driver, hammer, measuring tape, and a level will do it in most cases. But the best way to begin your installation is to watch the short and instructive installation video that you’ll find on our website. Here you will see how quickly and effortlessly you can hang your new barn door. But, if you would like the team at Trending Home Décor to look after the installation of your new door just let us know and we’ll arrange that for you. Trending Home Décor is a Canadian e-commerce website owned and managed by Canadians and for the most part selling Canadian products. We’re proud of our reputation for quality products and on-time delivery.